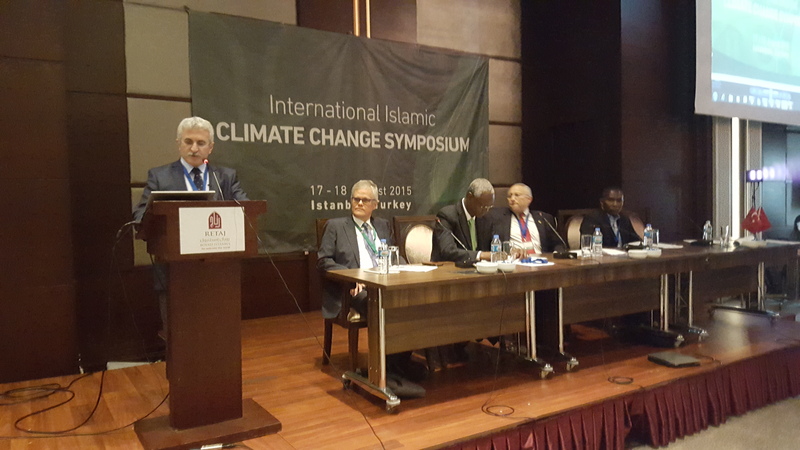 Welcome Speech delivered at the International Islamic Climate Change Symposium held in Istanbul Aug. 17-18, 2015.
by İbrahim Özdemir, Ipek University, Ankara, Turkey. Good morning! Welcome to Istanbul, the city of civilizations, arts, and hospitality. I am honored to be here today, to be joining this distinguished group of participants and speakers. I feel overwhelmed. I grew up in a small village as a child of a farmer. I enjoyed the beauty of natural environment with all its richness. When I saw my first but unfortunately the last wild wolf in my life, I was almost seven years old. I could still drink the water of creeks as it was crystal-clear then. Later, I learnt that, Rachel Carson was writing her seminal and groundbreaking book the Silent Spring in the same years. This humble book sparked and triggered many creative and sensitive minds to look at the problem in a new way. Now, I have four children and two grandchildren. I never thought that my descendants might not enjoy the same kind of life that I had. It seems they live in a different world. They never saw a wild animal in nature, unless in documentaries and zoo. I have concerns about their future and the world they are going to live in. Therefore, environmental problems in general and Climate Change in particular is a moral issue for me. Moreover, there is also a moral imperative as a Muslim scholar for me to look beyond my immediate family and to the whole creation as it has been created and sustained by God. In this spirit, let me remind you the metaphor used by Prophet Muhammad to highlight the importance of social problems and their impacts to his companions. He told them to think of people on a ship, some of them on top and some below. When those below decided to put a hole in the ship to meet their need for water, if those above do not prevent it, the ship will sink and everyone will drown; if they prevented them, everyone will be saved. We are all on the same ship of this world, the Planet Earth. Behaviors that will sink the ship should not be met with silence and indifference. Not only that, but positive action and support must be expected from everyone to reinforce the social fabric and improve the social order and environment. I have been an educator and an activist in the religious environment movement for more than 20 years. I’m often asked why Muslims do not care about environmental problems. Associated Press (AP) ran a story about environmental consciousness and activism in Muslim societies in 2012. They also talked to me over phone. According to the story, “at Friday prayers in Qatar’s most popular mosque, the imam discussed the civil war in Syria, the unrest in Egypt and the UN endorsement of an independent state of Palestine. Not a word about climate change, even though the Middle Eastern nation of Qatar was hosting a UN conference where nearly 200 countries tried to forge a joint plan to fight global warming, which climate activists say is the greatest modern challenge to mankind”. The reaction of a Muslim at the al-Khatabb mosque in Doha, when asked what he thought about the issue at hand was that: “Unfortunately the Arab and Islamic countries have political and economic problems”. Moreover, he argued, “Islam calls for the protection of the environment, but the Muslim countries are mostly poor and they didn’t cause pollution and aren’t affected by climate change”. The story concluded that although “the Qur’ān is filled with more than 1,500 verses about nature and the Earth, the voice of Islamic leaders is missing from the global dialogue on warming”. Unfortunately, many Muslim policy makers and even scientists also defend the same or similar arguments when discussing environmental protection or climate change. According to them, environmentalism is a new game of the capitalist West, which aims to prevent the development of Muslim countries. Therefore, they argue, we Muslims should also use and exploit natural resources for our economic and political development. Let me underline very boldly that, today it is a milestone in Islamic environmental and sustainable debates. Here, in Istanbul, the cradle of civilizations and cultures, we declare to the world that Islamic environmentalism exists in a variety of forms, reflecting varieties of contemporary Islamic as well as environmentalist thought. It exists in theories but also in several places in the world as practices. • Moral, sustainable finance, trade and business practices based on Islamic values. S. H. Nasr, a founding father of Islamic environmental thought, joined via video. We wish him good health and pray for a long and a fruitful life. In this, spirit I welcome you all and thank Fazlun Khlaid, his team and all contributed to this event. Welcome to Istanbul again, the cradle of civilizations, cultures, art, and science.